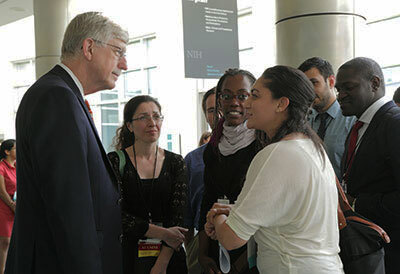 The most recent edition of NIH’s Global Health Matters Newsletter, features NIH Director, Dr. Francis S. Collins, meeting several of our NPGH fellows. Pictured from L-R is Dr. Collins, Anna Babakhanyan, Jonee Taylor, Mahsa Abassi, and Randolph Ngwafor. Trainees also had the opportunity to speak personally with Dr. Roger I. Glass, Director of the Fogarty International Center. Here is Dr. Glass with several trainees after a tour of the NIH Zebrafish Laboratory. NPGH trainees pictured include (L-R) Randolph Ngwafor, Paola Rondan, and Anjuli Wagner. Dr. Glass is on the right. Several of the PIs from the NPGH consortium contributed articles to the “Brain Disorders Across the Lifespan” supplement for Nature. Follow this link to view the complete supplement. 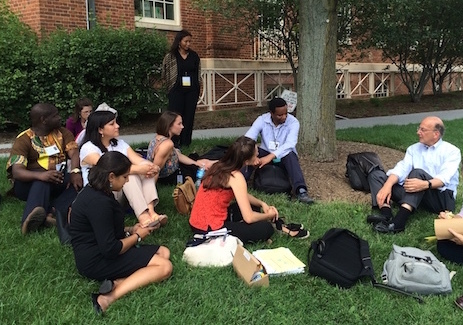 Opportunities for investigators from low- and middle-income countries (LMICs) to establish independent global health research careers are critical to building a robust global health workforce, but the mentored research experiences that foster research independence can be difficult to obtain. FIC currently has no program that targets this critical point in career development for LMIC scientists. FIC’s existing IRSDA (K01) program has been instrumental in launching successful independent global health research careers of U.S. investigators, but foreign applicants have not been eligible for NIH K01 awards. The goal of the Fogarty Research Career Development Award for Low- and Middle-Income Country Scientists is to provide a period of mentored research to early-career LMIC scientists to foster their research careers in association with U.S. scientists. Eligible applicants include LMIC investigators who hold academic junior faculty positions at LMIC institutions and who justify the need for release time from duties at their home institution to conduct a research project that is relevant to the health priorities of their country and can lead to future grant prospects. The broader goals are to ensure a career pathway for promising LMIC scientists, to strengthen the intellectual capacity of global health research at foreign institutions, and to foster long-lasting research collaborations. The expectation is that through this sustained period of research career development and training, awardees will launch global health research careers and become competitive for independent and collaborative research support with U.S. scientists. Similar to the K01, an individual would submit directly to the NIH and individual awards would be made. The award will enable recipients to conduct mentored research and career development activities under mentors who are accomplished investigators in the proposed research area and have experience developing independent investigators. One mentor must be based in the LMIC and one must be based in the U.S. The award will support a portion of the recipient’s salary, commensurate with the salary structure of the home institution. The award will provide funds toward the research costs of the recipient. To integrate activities with other scientifically-relevant FIC-supported activities, the program will use a distributed management model. A central coordinator will handle pre-review program inquiries. Awards will be assigned to relevant FIC staff for subsequent scientific and administrative oversight. 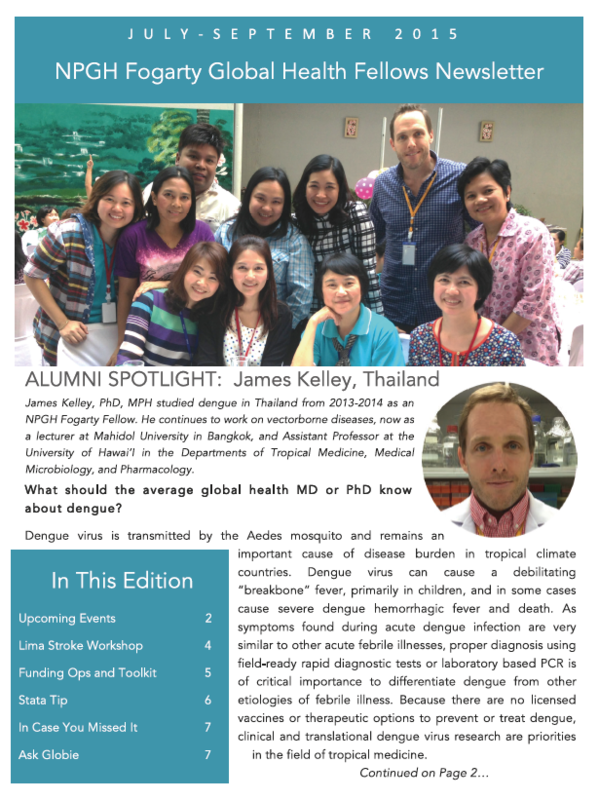 The American Journal of Tropical Medicine and Hygiene just published a paper written by the NPGH Fogarty Fellow PIs on “The Development and Implementation of a Competency-Based Curriculum for Training in Global Health Research.” Congratulations to Thanh Ton, Sophia Gladding, Joe Zunt, Chandy John, Vivek Nerurkar, Cheryl Moyer, Nicole Hobbs, Molly McCoy, and Joe Kolars.